To answer the second question concerning the name “blacksmith,” the term must be broken into two parts. “Smith” refers to someone who strikes metal into a desired shape, whereas “black” refers to the type of metal the smith uses. People easily understand what metals goldsmiths, coppersmiths and tinsmiths use, but are not aware that iron was called the black metal. It appears this color after being heated to a red, orange, yellow, or white color and then cooled. On the other hand, a whitesmith works cold black iron with files and stones, turning the iron white in color. Blacksmiths of the 18th and 19th centuries and even earlier could be found making a wide range of items. These items varied from kitchen utensils and household hardware to architectural hardware such as hinges, door handles, gates, railings and sign braces, as well as tools for themselves and other tradesmen. The particular type of work a blacksmith produced depended on several factors, the most important being where the smith was located. For example, a smith who was found in a city might specialize in architectural hardware, tools or kitchen utensils. A blacksmith located in a small village in the country would be busiest repairing farm implements such as plow shares, chains, and other such tools and occasionally producing new items. Depending on the blacksmith’s training and again his location, he may have been found shoeing an ox or horse. However, this was considered to be another trade. Those that primarily shoe oxen and horses are called farriers. There are many people who think that the “village smithy” was the jack-of-all-trades in North America. Those with this image have been influenced primarily by Hollywood’s Western movies. A forge fire and anvil, tools required for many tradesmen, such as farriers, blacksmiths and wheelwrights to name a few, are often shown next to a livery stable with a big sign BLACKSMITH. Research has shown that this type of blacksmith, the jack-of-all-trades, appeared most frequently in remote frontier areas during the 18th and 19th century. Sometimes blacksmiths and farriers would set up business together in the better-settled areas.1 The blacksmiths on the frontier who did shoe horses spent only about 25 percent of their time on such work. Fifty to 60 percent of their business consisted of repairing tools and farm implements. The rest of their time was devoted to producing new items such as tools and hardware. These types of combined shops appeared in North America for two major reasons. First, there was no established trade guild on this side of the Atlantic to regulate the business of the tradesmen and their apprentices. The other reason was logistical. They were keeping pace with the rapidly expanding settlements and filling the need for skilled tradesmen. The version of a blacksmith that Hollywood shows most frequently in Western movies did exist in the latter part of the 19th century. However, the blacksmith who did not shoe horses was more typical in the 18th and 19th centuries, and is still very prevalent into the 20th century. All types of blacksmiths and farriers in earlier times were very well-respected members of their communities and were usually located at the center of their villages. Throughout the ages, blacksmiths and other artisans were used by the military for building and maintaining fortifications as well as keeping armies on the move during campaigns. During the time of the American Revolution and the forming of the Continental Army, the special skills of tradesmen were also recruited. 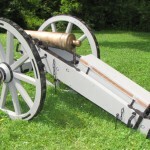 George Washington issued orders to recruit a regiment of men skilled in these trades into the Corps of Artificers: 49 carpenters, 40 blacksmiths, 20 wheelwrights, tinners and turners, and 12 harness makers to be enlisted for one year to work in an artillery shop in Pennsylvania.2 Washington also ordered a company of artillerists to consist of the following tradesmen to serve in the field traveling with the army: “a master carpenter, a master wheelwright, a master blacksmith, 2 tin men, 2 turners, 2 coopers, 4 harness makers, 2 nailers, 2 farriers, 6 wheelwrights, 25 carpenters, and 15 smiths.”3 One officer noted that this was never really a military unit but a collection of mechanics. Also important to the military, blacksmiths were located outside frontier fort walls such as Fort Ligonier in Pennsylvania and at “the bottoms” along the Niagara River at Fort Niagara,4 for the purpose of making and repairing items for the local Indians. The industrial revolutions of the 18th and 19th centuries are among the reasons that people think of the blacksmith as the jack-of-all-trades craftsmen. The blacksmiths who produced a specialized type of product, such as door hardware or tools, were either put out of work by new factories or absorbed into these factories. In either case, these smiths were not as visible to the general public or the romantic artists and photographers who could capture their images. Because of Hollywood’s influence and the lack of a guild system to regulate trades, many farriers call themselves blacksmiths today. Fortunately, during the late 19th and early 20th centuries, building surges utilizing classical designs demanded a great deal of hand-forged hardware. Thus, a revitalization of the blacksmith’s trade in a more traditional role was seen during these time periods. With the expansion of factories, railroads, and shipping, their needs for heavy forgings and tooling required more blacksmiths and those specializing in forging tools. The Great Depression, World War II, modern architectural designs and modern tools nearly dealt the fatal blow to the blacksmith’s trade. However, thanks to increased interest in historical restoration, reconstructions, living history and other traditional art forms, the blacksmith’s trade is no longer a dying art. Blacksmithing, as well as many other early trades, has been in a revival for at least 20 years and is still growing. Because of this revival and increased interest in hand-forged items, blacksmiths have begun once again to specialize. For example, the industrial blacksmith produces and repairs chisels, jack hammer bits and other tools. The traditional blacksmith may produce historical reproductions of architectural hardware, kitchen utensils, lighting devices, railings and gates. 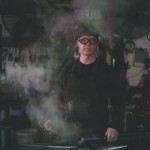 You may also find the artist blacksmith who produces sculptures. In most cases these smiths are too busy to shoe horses, nor have they ever learned how to shoe a horse. Likewise, most farriers are too busy to be found practicing the blacksmith’s trade. Notes 1. Early American Ironware: Cast and Wrought, Henry J. Kauffman, pages 82-83 2. Peterson, Harold L. The Book of the Continental Soldier. Harrisburg, PA: Promotory, Press-Stackpole, 1968, pages 265, 266. 3. Ibid. 4. Stevens, Paul L. A Kings Colonel at Niagara, 1774-1776. Youngstown, NY: Old Fort, Niagara, 1987. I lost the page number and having troubles locating my copy of the book. References Bealer, Alex. The Art of the Blacksmith. New York: Funk and Wagnalls, 1969. Kauffman, Henry J. Early American Ironware: Cast and Wrought. New York: Weathervane Books, 1966. Lasansky, Jeannette. To draw, upset, and weld : the work of the Pennsylvania rural blacksmith, 1742-1935. Lewisburg, Pa.: Oral Traditions Project of the Union County Historical Society, c1980 Moxon, Joseph. Mechanick Exercises. London: Midwinter and Leigb, 1703 Peterson, Harold L. The Book of the Continental Soldier. Harrisburg, PA: Promotory Press-Stackpole, 1968. Richardson, M.T. Practical Blacksmithing. New York: Weathervane Books, 1978. Schiffer, Herbert, Peter, and Nancy. Antique Iron. Exton, PA: Schiffer Publishing 1979. Simmons, Marc, and Frank Turley. Southwestern Colonial Ironwork. Santa Fe: Museum of New Mexico Press, 1980. Sonn, Albert. Early American Wrought Iron. New York: Bonanza Books, 1979. Stevens, Paul L. A Kings Colonel at Niagara, 1774-1776. Youngstown, NY: Old Fort Niagara, 1987.